* Quiet & peaceful country setting. * Only 15 minutes to beach & local golf course. * Private estate grounds with access to a swimming pool and spa pool! * For a 1 night stay option, please contact us direct by phone - (06) 372 3722. Welcome to Ica Station Homestead, one of the newest B & B and Wedding Venue properties in the Wairarapa. Here you can relax and re-charge your batteries in peace and privacy! The mature grounds exude privacy and seclusion and are in keeping with the long history of Ica. Welcome! 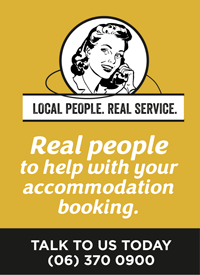 We are Masterton's most centrally located motel. Private farm retreat, rustic on the outside, modern comfort on the inside with rural mountain veiws. Set on our working sheep and beef farm, what was once a useable woodshed has been given new life as comfortable modern accommodation for those wanting a complete escape. Walkers and mountain bikers welcome and even horses can be accommodated by arrangement. Guided farm walks or tours can be arranged or just enjoy the peace and quiet. Just 10 mins west of Masterton with Taurarua mountain views. Close to many walking tracks. Architecturally designed home nestling within the natural landscape. Escape from the hustle and bustle of the city in this beautiful home surrounded by 5 acres of land bordering the vineyard of Matahiwi with panoramic views of the Tararua mountain range. The house is a contemporary open plan space with light flooding in from all angles. Open the large sliding doors and drink in the fresh air! The Solway Show Grounds are only an hour and half from the ferry or Wellington city, less from the hUtt Valley, and virtually the same distance from Levin and Palmerston North. Our rates are reasonable ... we charge $5 per head per night plus a small fee for power (depending on how long you stay) and your dog is also welcome! The normal requirements of dog ownership need to be adhered to while staying/visiting the park. Kia Ora and welcome to Millard Flat in central Masterton – Te Ore Ore.
Our two bedroom self contained flat in the front of our residence is an ideal base if your exploring the beautiful Wairarapa. Sleeping four guests with a double room, single room and an extra single bed. All linen is provided. It has a separate bathroom with shower only and a cosy open lounge/kitchen with heat pump/cooler. Nestled into the Mount Bruce area we offer accommodation for up to 10 people at Mount Bruce Lodge. Originally a Nurses Home built about 1910 the property has been maintained sympathetically retaining high ceilings, good sized rooms and views of the rural area. There are 4 bedrooms, one has a four poster bed, another has a Queen size bed. Another room has single beds and the other room has a bespoke set of king single size bunk beds. And finally, there is a sofa bed in the lounge to complete any large group.